Our good friend Tibor from the Hungarian website Index Digicam has laid his hands on Canon's new top model; the PowerShot Pro 1. Tibor, who is active with the largest Hungarian digital camera website since 1999, has published his opinion and hands-on experience of the freshly announced new Canon flagship. 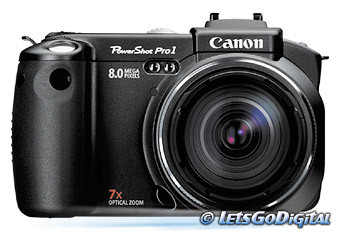 The Canon PowerShot Pro 1 has 8 Megapixels on board and features a very interesting optical zoom lens. The Pro 1 is the first compact camera from Canon to be fitted with a Canon professional L-series lens (f2.4-3.5 28-200mm USM lens). The new PowerShot model is definitely reaching out to the professional or advanced amateur out there. And with professional features that include RAW file recording and a hybrid AF system, combining TTL and external metering focusing systems for fast and precise auto-focus, the new Canon camera is standing right in the middle of the spotlight! LetsGoDigital is attending the PMA show in Las Vegas where we will see this new digital monster for ourselves, those of you who are not be able to catch a glimpse at the show should hop over to Index Digicam. Tibor will welcome you with open arms, your Hungarian skill of communication is probably just as well developed as mine, but don't let this frighten you, the First look of this interesting camera is also available in English! Hop on over for an exclusive first look of the PowerShot Pro 1 at Index Digicam.